Since 1998, Sepialine has focused exclusively on perfecting the art and science of tracking expenses—print, copy, phones, and more—with accuracy, efficiency, and a touch of humanity. Companies around the world, big and small, use Argos software every day to lower costs, reduce waste, raise user awareness, meet sustainability and green goals, and increase profits. When Sepialine first approached HiveMind, they needed to improve their branding overall, and rework their website which provided weak navigation and little or no Search visibility. They also wanted to use Inbound Marketing techniques to improve their communications with potential customers. We started a rebranding process for Sepialine that involved interviewing staff, customers, and partners. 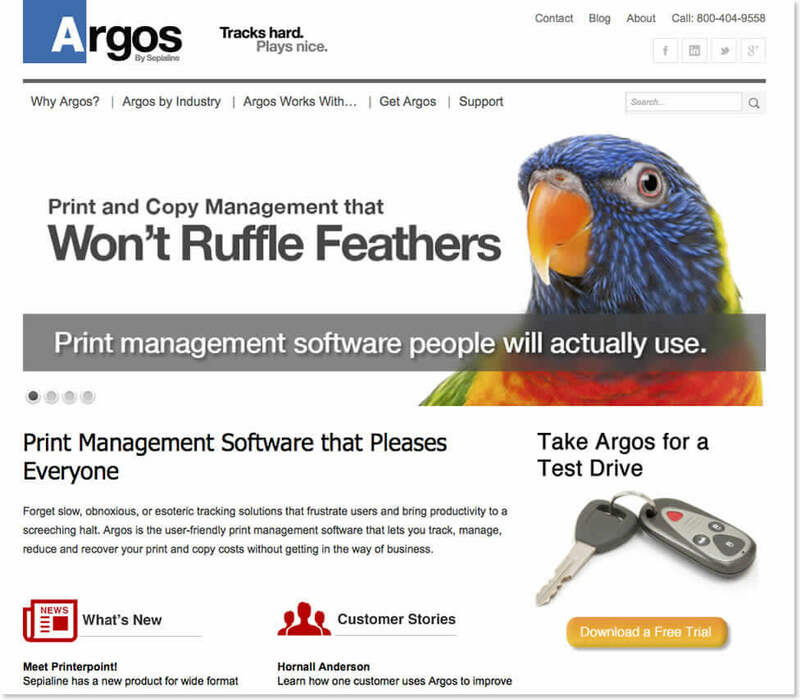 From that work, we discovered that the company had zero name recognition, but that their single product, Argos, was respected in the marketplace for its ease of use and transparency. We extended the idea when we rebuilt the company’s website around using a theme of “Print and copy management that won’t ruffle feathers.” Ongoing efforts included optimizing the site for search, implementing a lead nurturing platform, and contributing to blog and ebook writing and production. The site launched in late 2011, and still serves the company’s ambitious lead generation goals. We trained the company’s internal staff on the content management system and developed an editorial calendar to help them get the most from blogging and social media.